Title: The New | Testament | Of our Lord and Saviour | Jesus Christ: | Newly Translated out of the | Original Greek; | And with the former | Translations | Diligently compared and revised. | Appointed to be read in Churches. | Philadelphia: | Printed and Sold by | R. Aitken, | Printer and Bookseller, | Front Street. | 1777 | Spectamur agendo. Images: Title page (from the Bloomsbury Auction site). 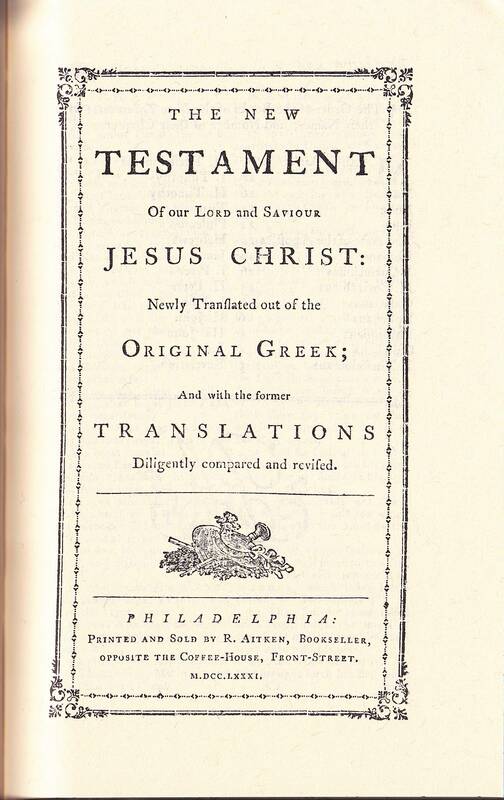 Comments: This is the first English New Testament printed in America. Comments: A copy sold for £105,000 ($164,818.50) on 29th November, 2011 (Bloomsbury Auctions Sale 35857). Comments: This is the first English Bible printed in America. Location: Cited copy is located at the Perkins School of Theology, Southern Methodist University. 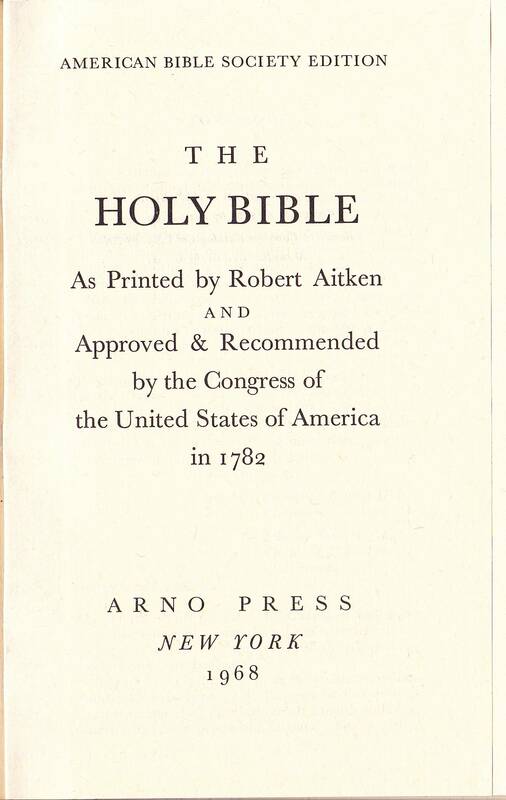 Several major libraries and museums have copies of the 1782 Aitken Bible. Comments: A copy lacking the title page and final leaf sold at the Swann Auction Galleries auction devoted to Printed & Manuscript Americana for $43,200 on September 17, 2009. Another copy with the title page but lacking several leaves of text sold on ebay for $12,500 on November 19, 2009 (Ebay No. 330378606779). A complete copy sold for $118,750 (including auctioneer's premium) on June 14, 2018, at Christies Sale #16082 (Lot No. 46). 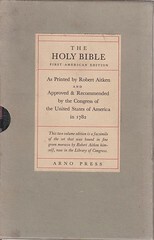 Title: American Bible Society Edition The Holy Bible as Printed by Robert Aitken and Approved & Recommended by the Congress of the United States of America in 1782. Comments: This is a facsimile of the first complete English Bible printed in America. It was produced by the Arno Press in 1968. 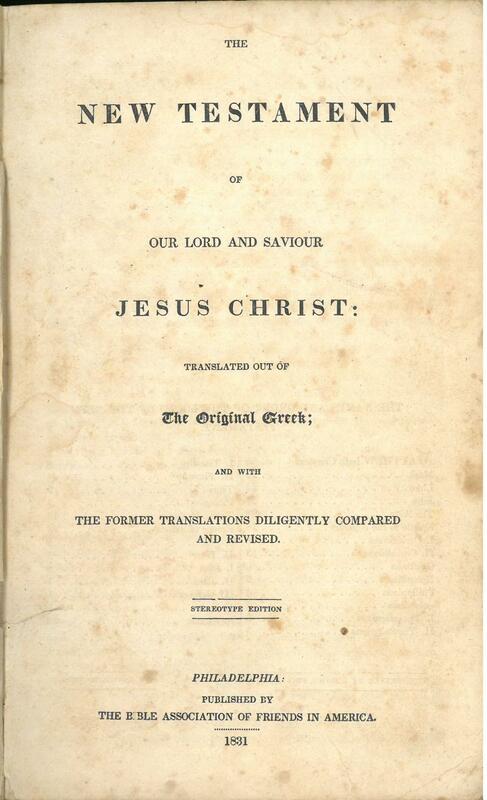 Title: The New Testament of our Lord and Saviour Jesus Christ, newly translated out of the Original Greek: and with the Former Translations Diligently Compared and Revised. Appointed to be Read in Churches. 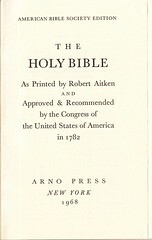 New York: Printed and sold by Hugh Gaine, at his Book-Store and Printing-Office, at the Bible, in Hanover-Square. M,DCC,XC. Description: Unpaged: 168 leaves, Text: 151x87 mm, Signatures: A-O12. Comments: This is the second New Testament printed in New York. The first was printed in 1789 by the same printer. 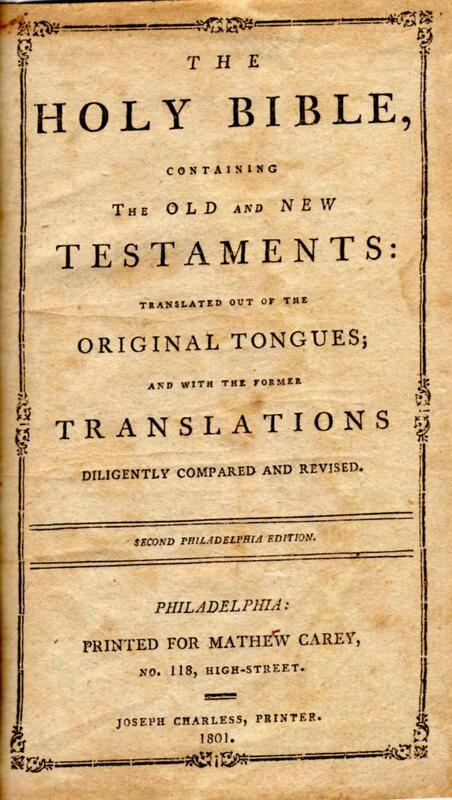 Title: The Holy Bible containing the Old and New Testaments: translated out of the original tongues: and with the Former Translations Diligently compared and revised. 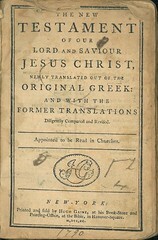 Publisher: Trenton: Printed and sold by Isaac Collins. Facsimile: An on-line facsimile is available at the Turpin Library at Dallas Theological Seminary. Comments: This is the first Bible printed in New Jersey. 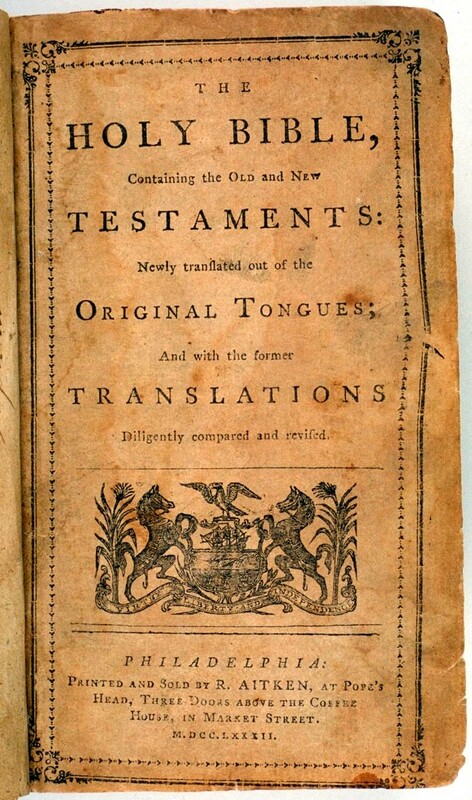 Title: The / Holy Bible / Containing / The Old and New / Testaments: / Translated out of the / Original Tongues; / And with the Former / Translations / Diligently Compared and Revised. / Second Philadelphia Edition. / Philadelphia: / Printed for Mathew Carey, / No. 118, High Street. / Joseph Charless, Printer. / 1801. Comments: Mathew Carey was an Irish immigrant publisher whose first Bible was a Douay Version in 1790 (q.v.). 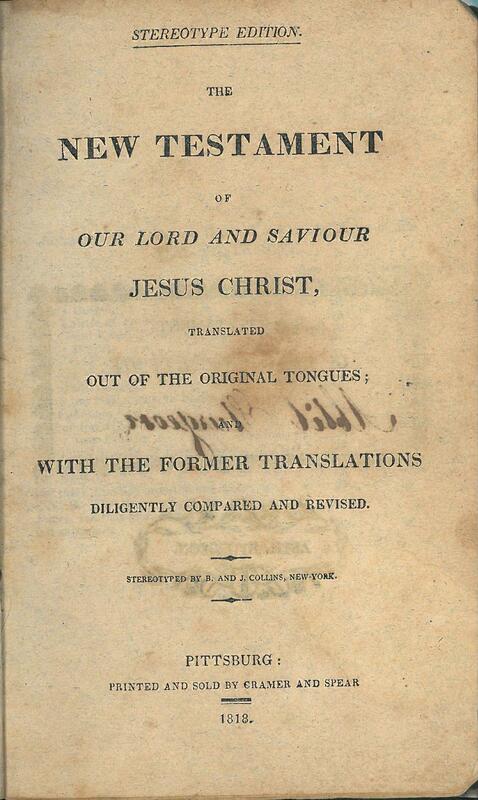 He would later become one of the most prolific publishers of editions in the Authorized Version, beginning in 1801. He published editions in the quarto (Hills 77) and duodecimo (Hills 79) formats in that year. However, Hills has no record of this "Second Philadelphia Edition." 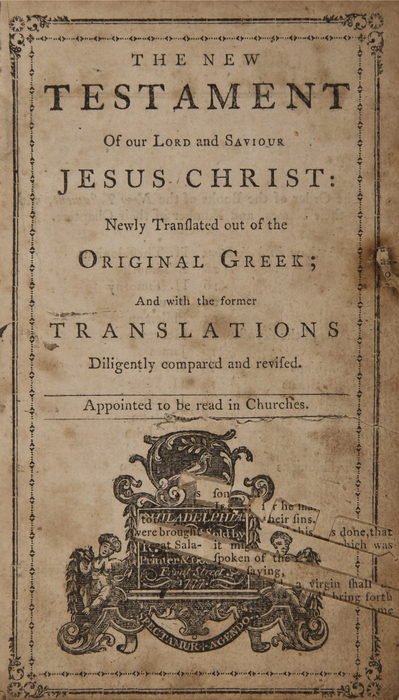 The New Testament title is dated 1802, indicates a different printer: Robert Carr, and was also issued separately (see Hills 99). 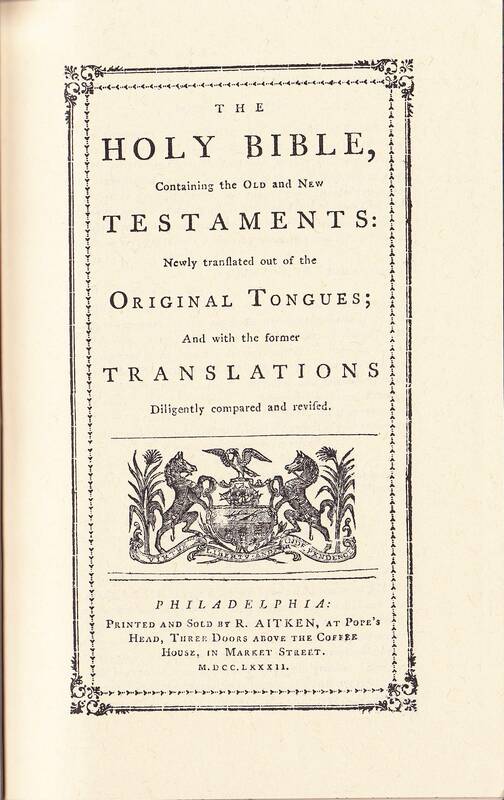 Publisher: Bible Society at Philadelphia: Philadelphia. Description: Copy 1: 12mo (OT) A-3G6 (NT) A-Q6 (p. 1-633, Table, NT Title, 1-192) Copy 2: 12mo (OT) A-Cc12Dd6 (NT)*B-*I12 (p. 1-633, Table, NT Title, 1-192). It appears, after examining two copies, that this was produced with is signatures of both 6 and 12 leaves. 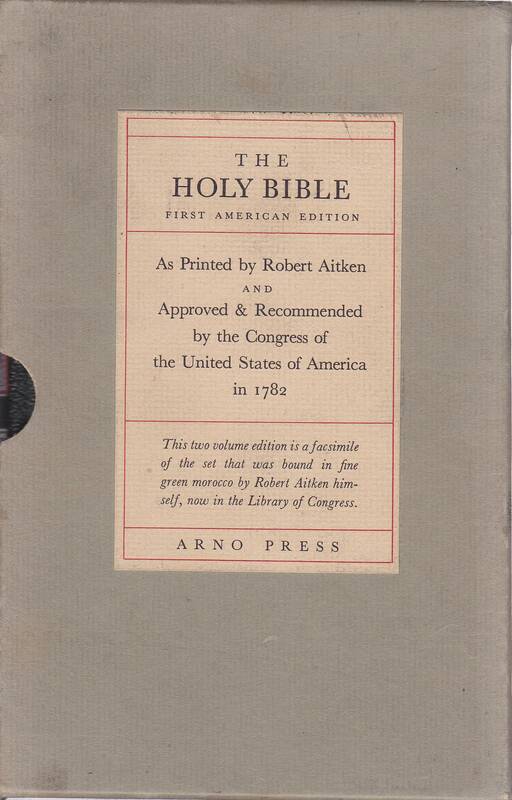 Comments: This is a copy of the first stereotyped Bible printed in the United States. The plates were prepared in London and they arrived in October of 1812. The US Government allowed them to enter duty free (the text of the Act of Congress may be found here). The initial print run was 1050 Bibles. A copy sold on eBay (item 160192298084) for $660.00 in December of 2007 and another copy sold on eBay (item 310236104164) for $449.99 in August of 2010. It appears that this Bible was produced with two different page sizes. In one copy, the page size is 10.5cm x 17.3cm while another is 10.8cm x 18.4cm. The text size is exactly the same in both volumes. The cover of the larger volume is stamped "Massachusets Bible Society" so it may have been a presentation piece to them. 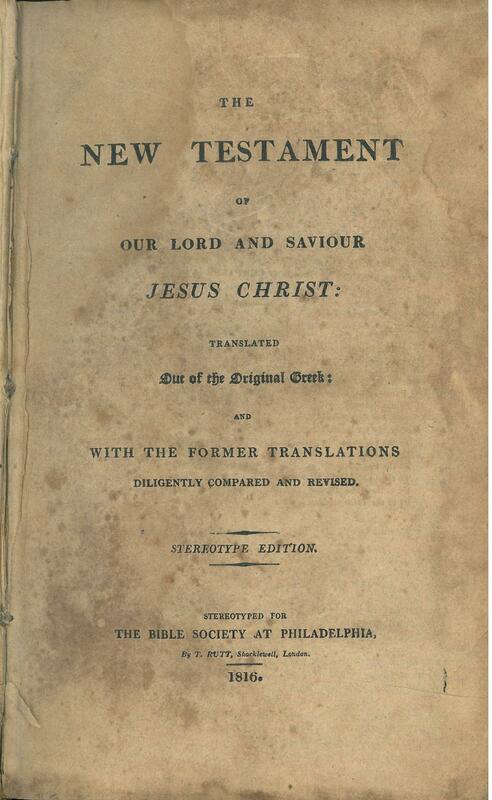 Location: A copy of this Bible may be found and viewed in person at the Pennsylvania Bible Society. 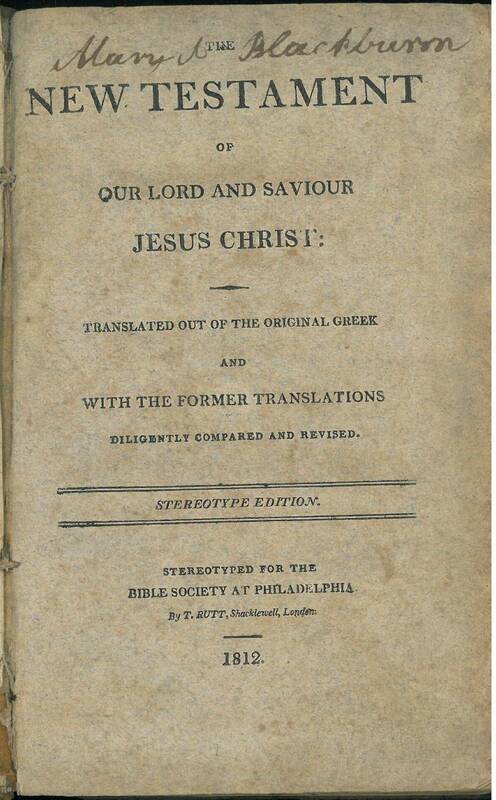 Shortly after the Bible Society of Philadelphia (now the Pennsylvania Bible Society) was formed in December 1808, the managers wanted to implement a printing process used in England by the British and Foreign Bible Society to mass produce Bibles called stereotyping. This method of printing was used sparingly in the United States during the early 1800s but never for publishing Bibles. Considering the high costs of such an endeavor, the managers decided to start off distributing Bibles purchased from Bible publishers in Philadelphia over its initial two years in operation. 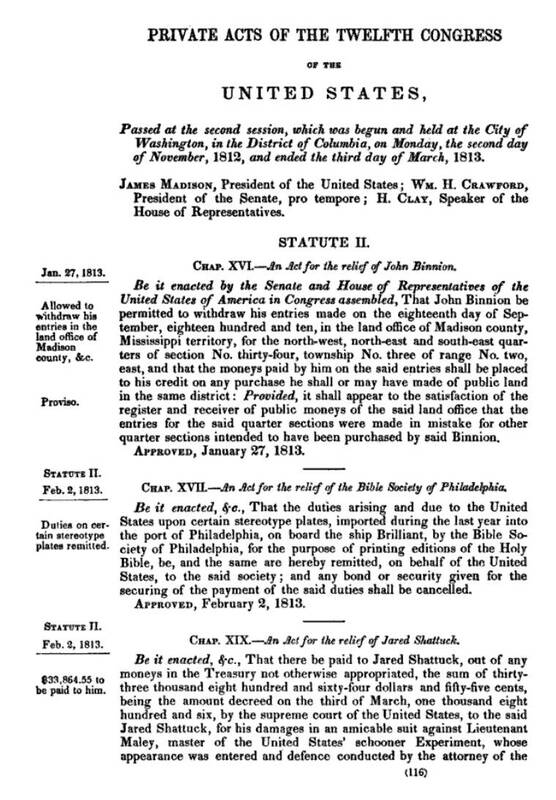 However the managers knew that utilizing the stereotype printing method would greatly increase Scripture distribution in Philadelphia and around the country, the managers raised over $7,000* with help from all the existing bible societies in America and from the British and Foreign Bible Society between 1809 and 1811. Once all the financing was gained an order for a set of stereotype plates was placed in Britain. However, getting the plates across the ocean and into the United States wasn’t without its issues. Since the U.S. and Great Britain were at war in 1812 there were tariffs placed on all imports from Britain and the U.S. customs house in Philadelphia was going to charge the Bible Society thousands of dollars to allow the plates into the country. Not having the funds to pay this fee, the managers petitioned to the state government and then to both houses of Congress for relief of these duties. This relief passed both the house and the senate and the Bible Society was allowed to import these plates free of charge. Once in the hands of printers thousands of Bibles were instantly printed and distributed to all parts of the country. Eventually over 17,000 Bibles and New Testaments would be printed from these and future plates. The forward-thinking of the managers placed the Bible Society at a unique advantage being the first institution in the U.S. to use this printing process, which became the standard for printing Bibles in the decades to follow. 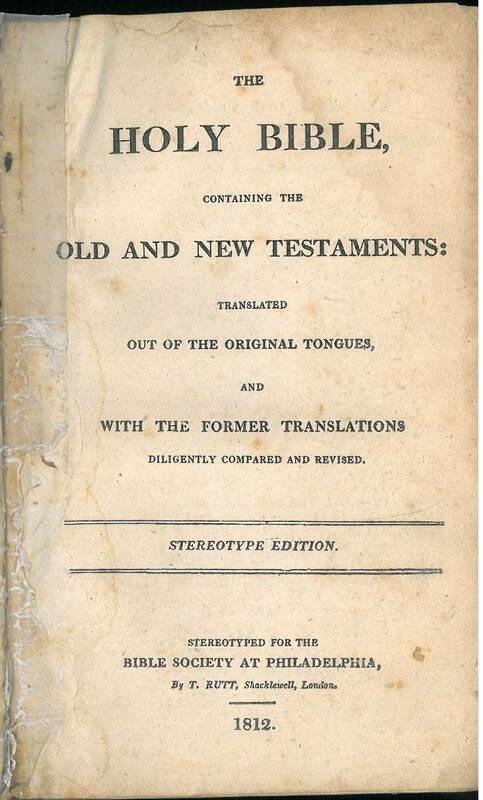 Comments: This is a copy of the first stereotyped New Testament printed in the United States. Hills says that the initial print run was 750 New Testaments. Recent sales: A copy sold on eBay (item 110879308671) for $158.50 in May 2012. 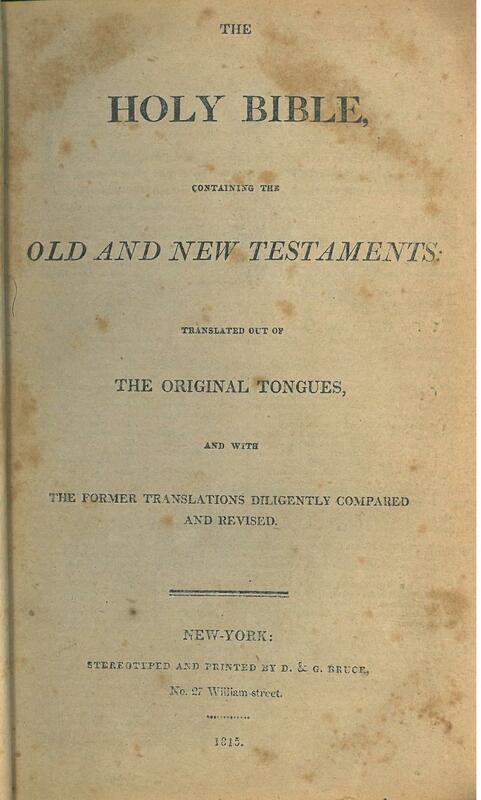 Title: The | Holy Bible, | Containing the | Old and New Testaments: | translated out of | the Original Tongues, | and with | the Former Translations Diligently Compared | and Revised. | New York: | Stereotyped and Printed by D. & G. Bruce | No. 27 William-street | 1815. Description: Nonpareil type, 684 with tables at the end of the Old Testament and on the verso of the New Testament title page. References: Hills 279, O'Callaghan 1815 entry 8. 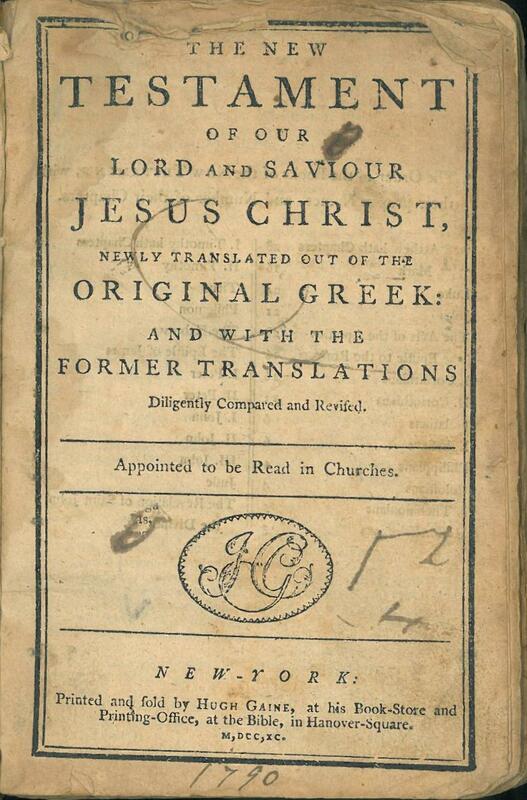 Comments: Verso of title page reads: "This first American stereotype Bible has been copied from the Edinburgh edition printed under the revision of the General Assembly of the Kirk of Scotland, and carefully compared with the Cambridge, Oxford, Hartford and New York editions." Title: Steroetype Edition. 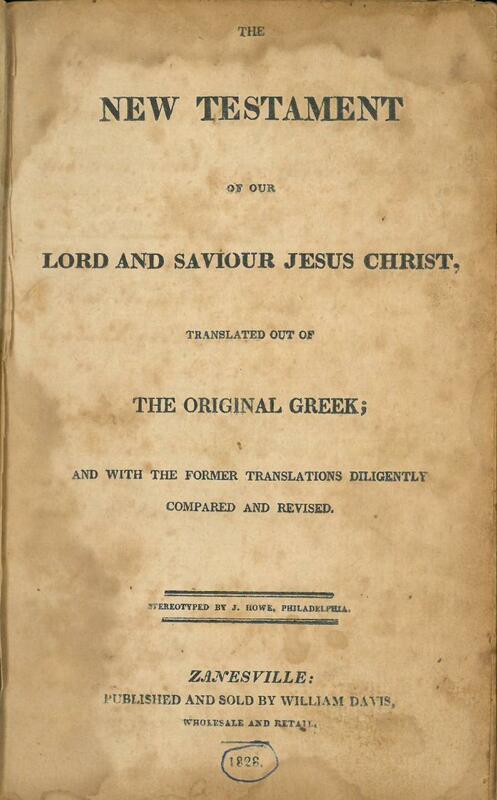 The New Testament of Our Lord and Savior Jesus Christ, Translated Out of the Original Tongues; with the Former Translations Diligently Compared and Revised. Stereotyped by J. and J. Collins, New York. Pittsburg: Printed and Sold by Cramer and Spear. 1818. Comments: This is the New Testament (only) from Hills 349 which was the first Bible printed west of the Allegheny River. 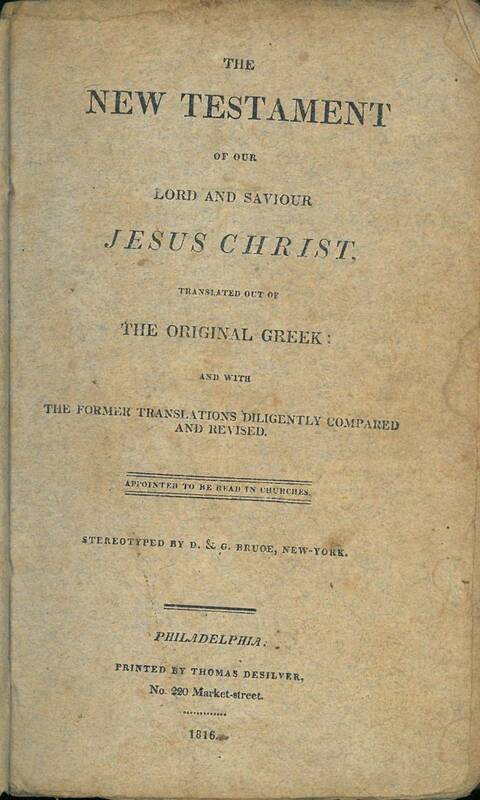 1828 edition published in Zanesville, Ohio. Comments: This is probably the second New Testament printed in Ohio. 1831 The Bible Association of Friends in America. Publisher: The Bible Association of Friends in America: Philadelphia.